Beetroot and 10k Plans – Part Deux! The second and final weekend of the nitrate supplementation trial produced what? Well, not quite a PB but only 4 seconds off my Shorne Woods parkrun PB and a “season’s best”! I wasn’t looking forward to downing the shot on Saturday morning but I have to admit, it did taste a little better, but only a little! Not enough to convince me to partake of regular consumption certainly. And again there was no obvious sign of whether this was the beetroot or the placebo, if you know what I mean! I wasn’t actually expecting anything miraculous to happen on Saturday even though I was feeling pretty confident this was the “beetroot” run. But when I passed the 1km mark in 5’ 20”ish there followed a very brief conversation in my head. It went something like, “expletive, expletive, I’m gonna die” quickly followed by “oooh, PB potential” (I normally pass the 1k mark in around 6’). I saw a familiar back up ahead, that of another Shorne Woods regular, Julie, and attached myself to her pace like a magnetic, not actually sure I’d manage to keep up for the whole 5k but I’d give it a go. I knew Julie was also taking part in the trial and I also knew she’d got a PB the previous week. I’m beginning to suspect there might be something to this nitrate supplementation! I’m not quite sure how I did it but I finished a couple of seconds behind Julie. Normally I’d have been gutted to have been so close to a PB but I wasn’t particularly disappointed to have missed out. I was actually delighted to have got so close. My Shorne Woods PB was set back in September and my times have been slipping so it was good to know there’s something positive going on. It’s going to be interesting to see what happens this weekend without any shot to rely on. Will I slip back to my recent slower times or will I be on a roll!? Apparently we will at some point find out which shot was which and I hope the results help the university with their research. 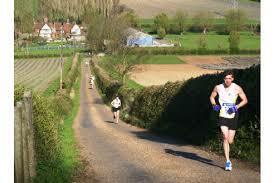 This coming weekend also sees me take part in my next 10k run, the first of two in May. This is a new event, the Beginners2Runners Woodland 10k being held in the environs of Barming, just outside Maidstone. The organisers describe the route as traversing “picturesque woodland”. This could be useful as the forecast at the moment is looking none too dry! Could be getting a bit of shelter from them there woods! I will report back in due course. Okay, Plan Worked, Whoop, Whoop! What Next? 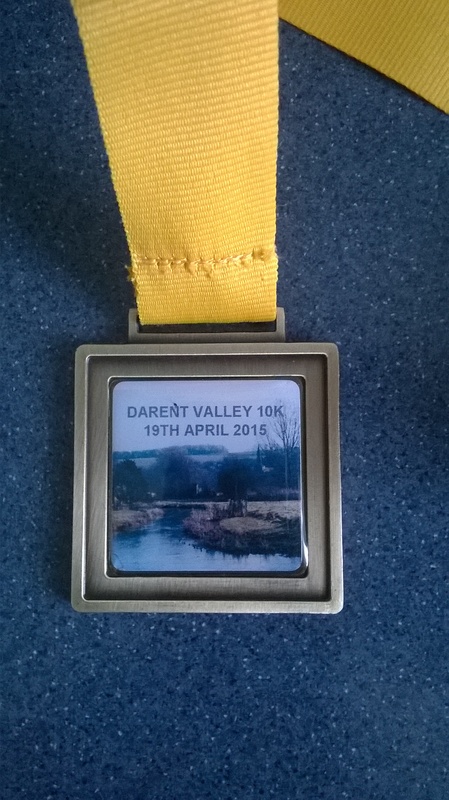 This morning I took part in the 25th Darent Valley 10k and I didn’t fall to pieces, didn’t have to walk, didn’t go off too fast, blah, blah, blah! I would love to say that I am now cured but I strongly suspect that this miracle happened because of that old runner’s homily …. The run started at 8.30am, a time on a Sunday morning when more sensible people are snuggled up in bed, hiding under the duvet, perhaps sleeping off the effects of a riotous Saturday night. Not me and 622 other runners! I’m sure there were lots of other runners elsewhere in the country/world but there were 623 of us congregating in the grounds of the Anthony Roper School in Eynsford, a lovely rural village in the depths of Kent. The event receives great reviews, waxing lyrical about the views and countryside and they are not exaggerating, the landscape was inspiring. Now of course, “views” suggests you’re either looking up, down or across at something and that inevitably means inclines are involved. It is made very clear in the reviews that hills are involved so nobody can claim to have been misled, but there is one corker just after the 6k mark which although I did run up, it was more of a pigeon stepped jog. Today’s events were even more surprising to me because yesterday morning, I ran my fastest parkrun since the New Year’s Day event. Now if you cast your mind back to my previous blog post you might recall that I’m taking part in Canterbury Christ Church University’s trial into the effects of nitrate supplementation on 5k running. Well, let me say first of all that a number of us on Saturday morning were agreed that the PB potential was really not worth the disgusting taste of the “shot”! I had tried to down mine in one but it took two gulps, rapidly followed by a glug of water and toast with plenty of marmalade to take away the taste! 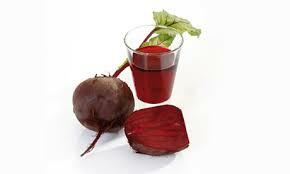 Now some of you may be aware of the unfortunate side effect on one of your bodily fluids from eating beetroot. TMI I know and I apologise but I have to advise that there was no sign of said side effect either pre or post run. So now I’m pretty sure that yesterday’s shot was the placebo. This means next week I’m in for a cracking run and PBs will be flying right, left and centre. Of course, there could be another less scientific reason for my success – the fact yesterday we went back to Course A (two long laps followed by one shorter lap) and where I seem to run quicker anyway! Let’s see what happens next Saturday, pressure’s on! In my post Paddock Wood Half Marathon blog post, I seem to recall stating publically that at my next half marathon (Great North Run), I would not be PB chasing. 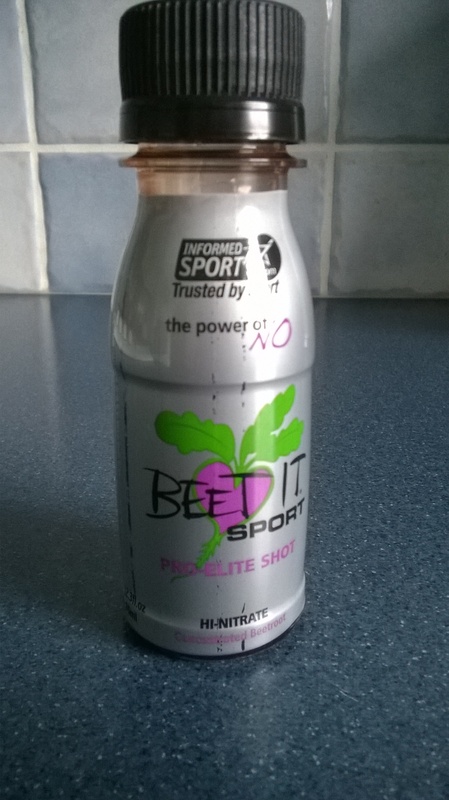 Then this weekend, I signed up for a research project being carried out by Canterbury Christ Church University to look at the possible influence of nitrate on running 5k – nitrate in the form of beetroot shots. And the selling point to me? The words “You could improve your personal best, run a season’s best or break your own course record for the Shorne Woods parkrun.” Sold, as sure as eggs is eggs!! My defence is that one of my 2015 fitness goals is to get a new parkrun PB. If somebody wants to potentially give me a helping hand, who am I to argue!? So after this week’s run, I took away my shot for ingestion at 7.00am this coming Saturday. It could be beetroot, it could be a placebo, who knows? The researchers assured me even they didn’t. After this coming Saturday’s run I’ll be given another shot to take ahead of the run on 25 April. I’ve read lots in the past about the possible benefits of nitrate supplementation on energy levels so I’m prepared to give it a go. But then I’ve also read a lot about the placebo effect and psychology! In any event, judging by recent parkrun performances, something dramatic is going to have to happen to get me a PB in the next two weeks. And if I do, will it be down to beetroot or will it be down to my brain, or even an outside chance, down to my fitness? I shall report back in due course. Don’t get your hopes up though. But I do like to feel I’m doing my bit for science! Now moving on to my other psychological problems – or more specifically those associated with my running. Over the last few weeks I have given a lot of thought to my participation in organised running events and I have come to the conclusion that something happens when I run with other people. 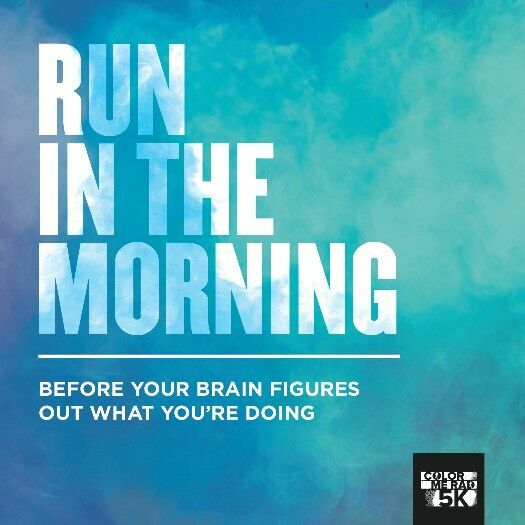 Except parkrun of course, that seems to work in a completely different but positive way, or is it just that the distance is shorter and there’s less time for something to go wrong? May – two runs, both on the Bank Holiday Mondays. 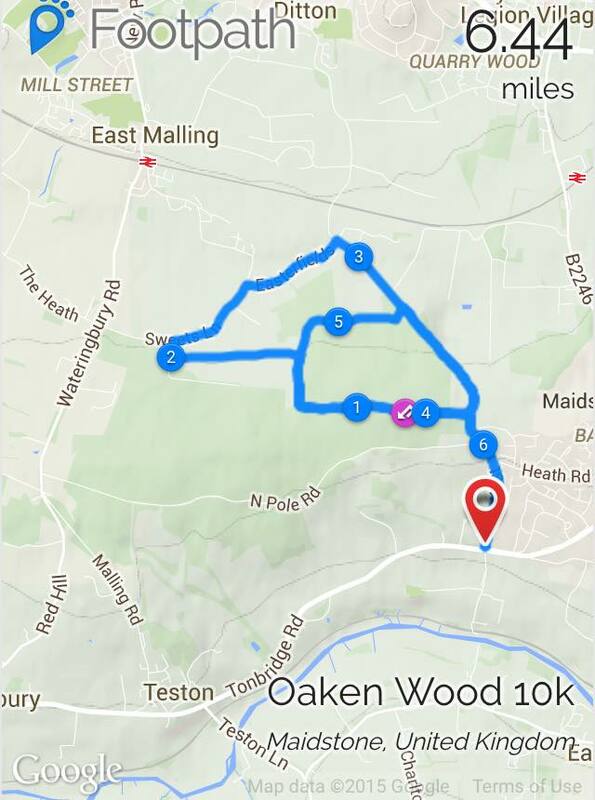 The first one is a new event, B2R’s (Beginners2Runners) Woodland Run around the Barming/Maidstone area. The second is the BUPA London 10000 around the Mall, Embankment and City. This will be the fifth time I’ve entered this one so you’d think familiarity would be on my side! 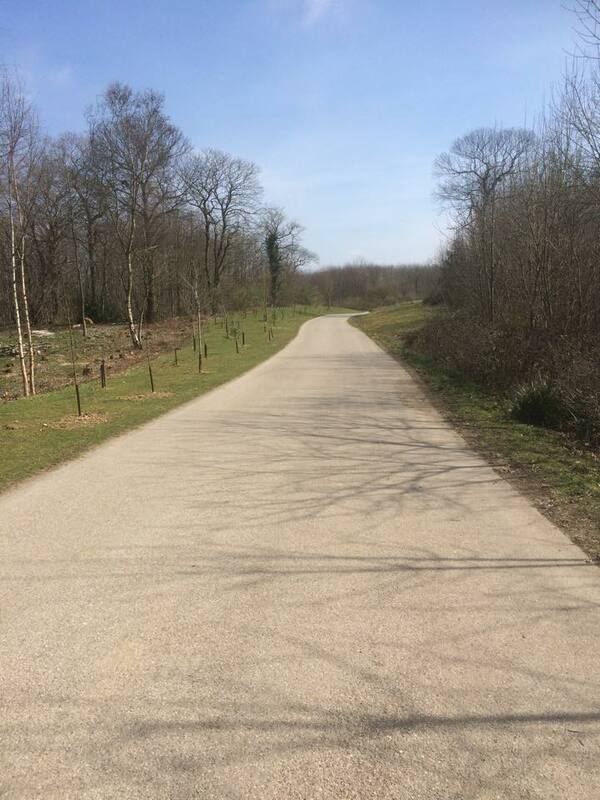 June – entered the Harvel 5, “tracing a path through the beautiful Kent countryside”. Yes, I know 5 miles is not 10k but I think that as it doesn’t start until 2pm and has the prospect to be hot, it’s got to feel like 10k. I’ve thought about doing this run for the last couple of years but have always been put off by the start time and that associated heat potential. But I was told on Saturday that it’s only the start and finish that are out in the open, the rest is through trees and therefore in the shade. I do hope my informant isn’t telling me porkies! However, just as an option to make sure I do the distance in June, I’ve also made a note of a 10k at Brands Hatch. The Heart of Kent Hospice run takes place on a Friday evening so should be a lot cooler and is also an opportunity to run around the race circuit to suss out whether I want to consider the half marathon next year, assuming its taking place again. July – Great Newham London 10k run, formerly the Back to the Stadium/Anniversary Run which once more finishes on the Olympic Stadium track. When I did the original Anniversary Run it was only 8k, now in its rebranded format, they’ve managed to extend it by another 2k. Taking place in July, here’s another potential “hot” run! August – The 4th Gravesend Cyclopark 10k taking place on a Friday evening. I know the course here from my elliptigo adventures and I would say it’s quite undulating. I think its four laps which will hopefully be slightly less tedious than running the 17 laps required from the Kent Roadrunner Marathon event which takes place here. There’s only so many times you can see the A2 or Morrisons before you start going a bit stir crazy surely?! Although I see it’s a sell out again this year. September – two options here, the Shoreham Woods 10k Trail Run or the Dartford Bridge 10k, one pre and one post Great North Run. Shoreham Woods sounds and looks prettier although not PB material. October – I’m going back to Ashford for the Givaudan 10k, that’ll be my fifth time here too and the location of my 10k PB. I missed it last year because of my Royal Parks Half Marathon place so it’ll be good to go back, although I do hope it’s a bit drier than in 2013! You may have noticed that some of these runs are off road so I’m thinking of buying some trail shoes! I’ve also managed to find races which don’t interfere too much with junior parkrun on a Sunday morning. There are a few exceptions to the Sunday morning embargo but on the whole, I’m pretty pleased with my date selection. So next weekend (hopefully) we start putting my plan into practice. Watch out for my reports! I quite frequently come across a runners’ forum/magazine/website survey questioning whether the readers run to enable them to eat cake, not necessarily just cake but you get the idea. My answer is – quite possibly, yes! And as we’ve now finished the first quarter of 2015 (where did that go), I thought it timely to spend Easter weekend reviewing progress on my 2015 goals. I wont bore you with a blow by blow account of current status on each one but suffice to say one has been completed (attend Leadership in Running Fitness course) and another is being achieved consistently (take off trainers properly, ie, undo the laces first). Others are progressing slowly, others haven’t even been started and some are quite possibly going to be failed – I have in mind here the half marathon PB – see last post! One goal was to get to a certain weight (no, I’m not divulging, top secret information) and at New Year this entailed losing 4lb. That should have been a piece of cake (sorry, couldn’t resist that). Unfortunately, it seems that I’m going in the opposite direction and now have 7lb to offload. Just over a year ago my weight was coming down slowly and without any real changes to my diet. I put it down to my return to more regular and consistent running. And despite adherence to my Jantastic targets and my half marathon training plan, the weight has slowly but definitely started to creep back on. 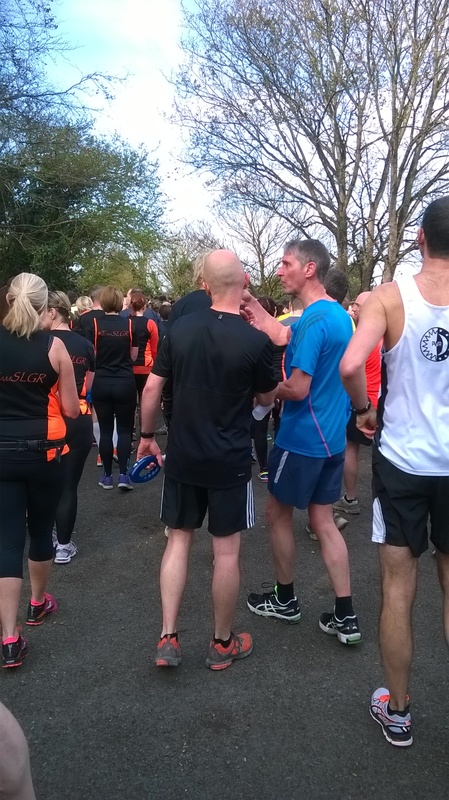 This is a photo I tweeted yesterday post parkrun and this quite possibly sums it up. I know I’m not the only one. Nowadays you can’t move in the cafe at Shorne parkrun post event and if there’s an anniversary or landmark run, cake and chocolate can usually be found at the finish line. I also know from conversations with other parkrunners that Shorne is not the only event with goodies on offer. In fact I wonder if there is a parkrun anywhere in the world that isn’t centred around a cafe of some sort to allow post run deliberations to be held over a late breakfast involving bacon, cake, croissant, etc, etc but not necessarily all at once. Although then again 😉 I’m not totally convinced that we run off all the calories consumed post run but it is a good excuse. “I run, therefore I will eat cake/chocolate/cheese/bacon” – delete as appropriate. I totally agree that running seems to suppress the appetite but in my case this is only a temporary affect. I seemed to spend the first half of last week making up for the 1500 calories I apparently used at Paddock Wood. This was also exacerbated by a full five days of no exercise, apart from an excellent yoga class which found my upper body aching from downward dogitis. Who needs press ups?! Desperate times call for desperate measures and now that my birthday and Easter are out of the way, I have no excuse. Part of my brain is also telling me that if I lose the weight, I’ll run faster! So with my listomania called into play, we now have a schedule to shed those 7lbs over the next three months. Obviously we don’t want to go overboard, cocktails still need to be consumed on a regular basis but cake is out! 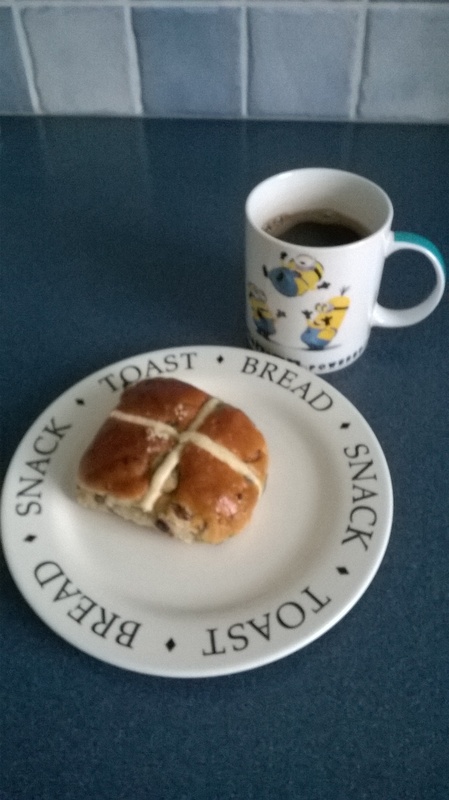 My Lent starts on Tuesday. This will mean that my next quarterly progress review will announce the success of at least one target. Only problem is, I’ll then have to maintain that loss over the remaining six months!